This post is aimed for first time parents, people who are not parents themselves and parents of all ages. Don't read half way, read it all. Then you will understand what this post is all about. In this world there are people out there who acts like the perfect parent and I thought I would give you all some tips on how to be the perfect parent. Breastfeed - You have to breastfeed your baby. You can't use formula. Many problems can happen to your child if you use formula. Breast is best remember. So use it! 2 Hour TV time limit - TV is bad. Don't let your baby, toddler or child watch TV for longer than two hours a day. All children seem to do these days is watch TV! What is the world coming too? Your child must sleep all night - Your child has to sleep all night. You must be doing something wrong if you child doesn't go straight to sleep with no fuss at all, at 7pm until 7am the next morning. Have a well behaved child in public - Your child must not, I repeat must not throw tantrums in public. That shows you are not capable of being a parent. You must not know how to discipline your child. No Ipad or any other up to date technology - No ipad's, no phones, no nothing! You're a lazy parent if you do this! This is wrong at every level. Get up in the mornings! - When your child wakes up, you wake up. Don't lie in bed. You all go downstairs every single day. Don't be lazy! Veg, Veg, Veg! - Feed your child vegetables and fruit. Give them their five-a-day. You're a lazy parent if you give them a plate of chips and chicken nuggets, do you want a bad future for them?! Every child LOVES veg and fruit! Your home must be spotless - Why should there be an excuse for mess? Stop being lazy, get off your backside and keep on top of the house! Make sure your child is clean, at all times - Do you not wash your child? Why has your child got mud on their trousers? Why is their hair messy? Are you not looking after your child?! Your child must be potty trained by the age of 2 - There is no excuse. Every single child is ready to be out of nappies before the age of two years! Don't ignore your friends - Just because you have a child now, don't ignore your friends! It's only a child! You should still have time to reply to text messages and come out! You must stay with child 24/7 - You're a bad parent if you leave your child with someone else. They are your responsibility not theirs! Do you recognise anything from the above? Has anyone told you anything from above, about your parenting skills? Anything sound familiar? The thing is with this strange world we live in, there are so many parents but many of those parents judge others. They judge the way others bring up their children. They judget the way they handle a child who is having a tantrum in the middle of a store. No parent can do right. Breastfeed - Many Mothers wants to breastfeed but can't. The one you might be judging for bottle feeding has probably been up all hours expressing milk for her little one. The other one you may be judging, just didn't want to breastfeed. Why is that ok? Because it was her choice. This is a 'free' world. No one should be judged by their choices. Breastfeeding or formula feeding, that baby is getting fed. Isn't that all that matters? 2 Hour TV time limit - We live in a world where technology is fantastic. They are updating everything. Why should your child be given a time limit for TV? You can work a routine by switiching the TV on during meal times or in-between. Many programmes these days learn children many things. Your child must sleep all night - You know those people who think they can get their child to sleep all night (they haven't got kids themselves!). I say good luck to them when they become parents. There are nights where your child may be ill, uncomfortable, wants a drink or just isn't a good sleeper. Every child is different. Have a well behaved child in public - You know that parent you are judging by apparently not being able to 'handle' their child? That child had been playing up all morning and day, oh and was up most of the night! That parent is suffering from depression. That parents just wants to scream and cry. That parent wants someone to go up to them and hear some positive words. No Ipad or any other up to date technology - The things is with today iPad's are everywhere. They are at schools, some restaurants and libraries. They are also another great way to learn your child things. Get up in the mornings! - When you're a parent you do have days where you want to be lazy. You want to have morning cuddles with your babies. Why shouldn't you? Veg, Veg, Veg! - Some children don't like veg or fruit. Why should kids be stopped eating chicken nuggets, McDonalds and so on? I say, as long as they don't get given takeaways and fatty foods all day everyday, what is the problem? Your home must be spotless - Dear non-parents, keeping your house spotless when you either have a baby crying, toddler wanting you constantly or a child who keeps taking everything out (the things you just kept away! ), there is never a time the house is spotless unless you have a good few hours away from the child or children. But within 10 minutes or less of that child back in the house, expect some mess again. Make sure your child is clean, at all times - I'm not going to stop my child being adventurous outside. If they want to play in mud, jump in muddy puddles and run around, I'll let them! They'll have a nice warm bath when they are back home. Your child must be potty trained by the age of 2 - Every child is different. There is no right time for potty training, only when they child is ready. Don't ignore your friends - Sorry I couldn't answer your text, my child wanted their nappy changing, then they wanted feeding but then they filled a nappy again! / My toddler is really clingy to me today. I'm busy playing with my kids. Your text can wait. You must stay with child 24/7 - Every single parent deserves a break. No one is a bad parent if you have a night off parenting. But even when your child is away, you can't stop thinking about them! Don't feel guilty for having a break. There are too many judgmental people in this world. I had an old friend a couple of years back who didn't seem to understand that when she was over I had to stop talking or cut across her because my girls wanted something. Those non-parents and even parents themselves have the cheek to judge others by the way other parents bring up their child. It needs to stop. This is such a great post. The first set of "tips" really bug me. Although I'm not a parent or a parent to be it's clear perfection is what you make it. Each child/parent is different and you adapt to your child. 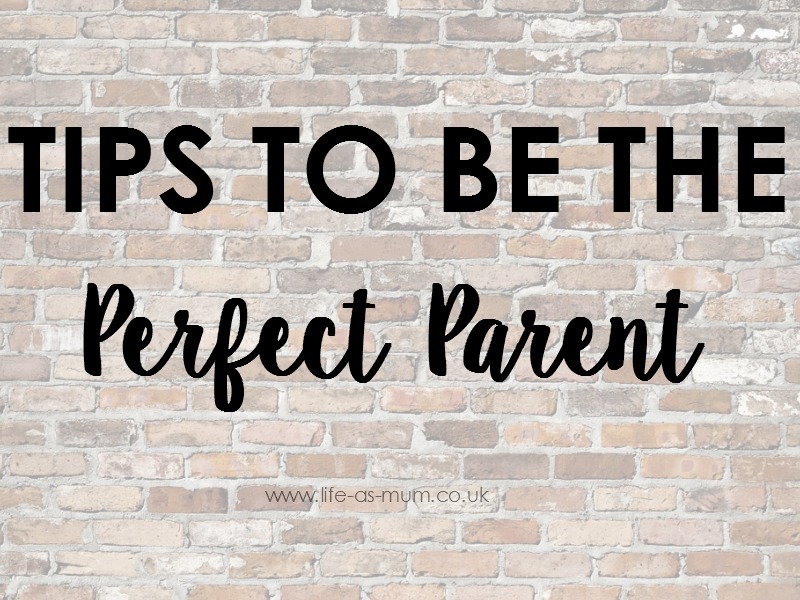 Don't think that such a thing as a 'perfect' mother exists - everyone does it in their own way but the pressure to do all the things you listed above makes people think otherwise! Such a great post. I don't think there is such thing as a 'Perfect Parent' everyone has there own way of doing things. * when I say healthy, other than the constat colds and bugs they pick up at nursery because oh my god I send them to childcare so I can work, to pay those bills to keep them in a comfy home. I don't think anyone is the perfect parent, not even rich celebs. None of us are perfect. What a great post. I think it's awful the amount of pressure parents are put under to do the "right thing", the thing is each parent and child is different and everyone should learn to accept that. Nobody is perfect!